relay team won the Relay Performance of the Year at the annual USA Swimming Golden Goggle Awards Monday. Adrian anchored the U.S. to wins in the 4×100 free and the 4×100 medley relay and won bronze in both the 50- and 100-meter freestyle events. Olympic gold medalists Michael Phelps and Katie Ledecky both earned Athlete of the Year honors for the third consecutive year. Phelps won six medals this summer, including five gold, and took the male Athlete of the Year award for the seventh time overall. Phelps also won Race of the Year for his 200-meter butterfly win at the Rio Olympics and was a member of both winning relays. He was also the fifth recipient of USA Swimming’s IMPACT Award, a lifetime achievement honor for contributions to the sport. Ledecky won female Athlete of the Year for a record fourth consecutive year. Ledecky won four golds at Rio, joining Debbie Meyer as the only women to win the 200, 400 and 800 freestyle events at the same Olympics. Simone Manuel won female Race of the Year for her gold in the 100 freestyle in Rio, when she set an American and Olympic record at 52.70 seconds. Also, here’s a link to a video by swimswam of Nathan speaking on the red carpet. 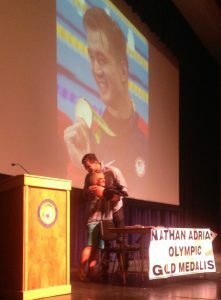 Bremerton’s Olympic champion Nathan Adrian was nominated for three Golden Goggles, USA Swimming’s equivalent of the Oscars, on Wednesday. Adrian, who came away from the Rio Games with four medals, two golds and two bronze, was nominated for male athlete of the year along with Michael Phelps, Anthony Ervin and Ryan Murphy. Adrian was also nominated in the relay performance of the year category for the 400 free relay and the 400 medley relay. He helped Team USA to gold in both those events and individually earned bronze in the 100 freestyle and 50 freestyle. The Golden Goggles, which act as a fundraising gala for the USA Swimmng Foundation which Adrian is an ambassador, is scheduled for Nov. 21 at the Marriott Marquis in New York City. Online fan voting is open and continues through Nov. 11. Go to usaswiming.org to vote. COLORADO SPRINGS, Colo. – After adding to his record-setting career total with six medals, including five gold, at the 2016 Olympic Games, Michael Phelps (Baltimore, Md./North Baltimore Aquatic Club) leads the way with five nominations for the 2016 USA Swimming Golden Goggle Awards, set for Monday, Nov. 21, at the Marriott Marquis in New York City. The nation’s top swimmers and coaches are nominated in eight categories for the 13th Annual Golden Goggle Awards, the celebration and fundraising gala honoring the sport’s top performances of the year. This year’s event, emceed by NBC Sports’ Bob Costas, will once again mix swimming stars with celebrities, business leaders and entertainment icons in Times Square. Phelps’ five nominations include Male Athlete of the Year, Male Race of the Year for the 200-meter butterfly and 200-meter individual medley at the Olympic Games and Relay Performance of the Year for the men’s 4x100m free relay and 4x100m medley relay in Rio. Phelps is a six-time winner of Male Athlete of the Year honors, including each of the last two years. Earning three Golden Goggle nominations each were Maya DiRado (Santa Rosa, Calif./Stanford Swimming), Anthony Ervin (Valencia, Calif./SwimMAC Carolina), Katie Ledecky (Bethesda, Md./Nation’s Capital Swim Club) and Ryan Murphy (Jacksonville, Fla./California Aquatics). Ledecky is nominated for Female Athlete of the Year, Female Race of the Year for the 800m free in Rio and Relay Performance of the Year for the 4x200m free relay at the Olympic Games. She will look to become the first athlete – male or female – to win Golden Goggles’ Athlete of the Year honors in four consecutive years. Golden Goggle Award nominations are based on the year’s top accomplishments by U.S. swimmers, focusing primarily on the 2016 Olympic Games. The Americans topped the medal table in Rio de Janeiro with 33 total medals, including 16 gold. The complete list of 2016 Golden Goggle Award nominees by category is below. Online fan voting is now open and will continue through Friday, Nov. 11. A percentage of the fan vote will count towards the final ballot. Beginning later this week USA Swimming will highlight Golden Goggle Awards categories weekly on usaswimming.org and across its social media channels in the lead-up to the Nov. 21 event. Proceeds from the Golden Goggle Awards benefit the USA Swimming Foundation, which has the mission to save lives and build champions – in the pool and in life. In addition to its Make a Splash initiative, a national, child-focused water safety campaign that stresses the importance of learning to swim, the USA Swimming Foundation supports the U.S. National Team and its development efforts aim to establish an endowment to strengthen the future of USA Swimming’s programs and services. The Foundation also serves as the home for our National and Olympic Team Alumni reunions and regional events. Back in July I wrote this blog post about Nathan Adrian’s participation in the Swim Across America to benefit Seattle Cancer Care Alliance and to honor his friend and teammate Matt Benoit, who died of cancer in April. Well, the swim is Saturday at Luther Burbank Park, Mercer Island, and it looks like it’s going to be a gorgeous, and warm, day. Nathan was in Seattle today, he co-hosted Evening Magazine and was on one of the local TV stations to promote Saturday’s event. Also, here is a link to Nathan’s SAA page. He is swimming the half-mile distance, which starts at 8:30 a.m.
Bremerton’s version of The Beatles were in town Monday. OK, it would be one Beatle and it would be multiple-Olympic gold medalist Nathan Adrian. I don’t think the adjective fervor describes the intensity to which the strapping 6-foot-6 swimmer received when he was introduced to the public in a welcome-home fete at Bremerton High School’s Performing Arts Center. Ardor? Zeal? Those come close. Receiving nearly the same amount of applause were his parents, Jim and Cecilia, who have picked up some worldwide notoriety thanks to their youngest son; older brother Justin and his wife Hilary and their toddler daughter and soon-to-be-born second child, and older sister Donella and her husband Barry and their three children were also on hand. 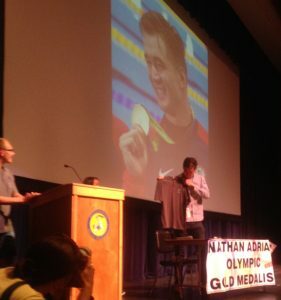 Adrian was given a key to the city by Bremerton Mayor Patty Lent, and Bremerton High swim team captain Nathan Rubie, a state participant himself, also presented Adrian with a Knights’ swim team t-shirt. Remarks were given by Bremerton School District superintendent Aaron Leavell, new principal Monica Sweet and Adrian’s former age-group swim coach at Olympic Aquatic Club Bonnie Burmaster. On hand were nearly 1,200 fans, former teachers, community members who wanted a chance to greet Adrian. 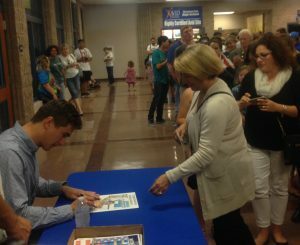 Fans will have a chance give Bremerton’s Nathan Adrian a hero’s welcome, ask questions and receive an autograph from the multiple Olympic gold medalist on Monday, Aug. 29 at Bremerton High School’s Performing Arts Center at 5:30 p.m.
Adrian returns to his hometown for an autograph session, question and answer period and those attending will have a chance to hear Nathan speak about his experiences in Rio after winning two gold medals and two bronze medals. Adrian will arrive at the high school after being driven from east Bremerton to west Bremerton from 5:15-5:30 p.m., across the Manette Bridge, up 11th Street to the high school. The public is welcome to wave, take pictures and cheer for Adrian along the route. 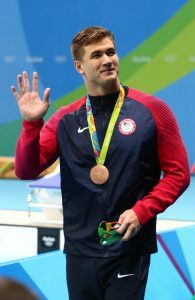 Nathan Adrian of Bremerton won his third medal at the Rio Olympics on Friday when he finished with a bronze in the 50-meter freestyle in Rio de Janeiro, Brazil. Adrian touched the wall in 21.49 seconds. U.S. teammate Anthony Ervin won the gold in 21.40 and France’s Florent Manaudou, who won gold in 2012, earned the silver in 21.41. 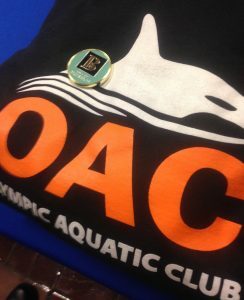 Adrian won a gold medal on Sunday anchoring the 4×100 free relay and then won a bronze in the 100 freestyle in Wednesday. He will swim in the 4×100 medley relay at 6 p.m. on Saturday and look to earn his fourth medal. Coming off his bronze-medal finish in the 100 freestyle late Wednesday night in Rio, Bremerton’s Nathan Adrian won his heat in the 50 freestyle Thursday morning to qualify for tonight’s semifinals. Adrian touched the wall in 21.61 seconds, out-touching teammate Anthony Ervin in 21.63. The evening session starts at 6 p.m. 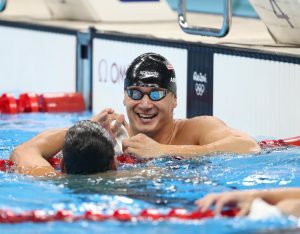 It can be seen live on CBC locally, on nbcolympics.com or on tape delay on NBC at 8 p.m.
Olympic champion Nathan Adrian of Bremerton earned a bronze medal in the 100 freestyle on Wednesday evening, in 47.85 seconds at the Rio Olympics. Adrian was trying to become the first American to win back-to-back golds in the sprint event since Johnny Weismuller did it in 1924-28. It’s Adrian’s second medal of the games, he anchored the 4×100 free relay on Sunday to a win, and his sixth career Olympic medal. Adrian was out-touched at the wall by gold medalist Kyle Chalmers in 47.58 and Belgium’s Pieter Timmers in 47.80 for silver. Adrian said he believed he was able to swim his own race. He will swim Thursday morning in the preliminaries in the 50 freestyle with the semifinals at 6 p.m.
Bremerton’s Nathan Adrian didn’t leave any doubt this time. After just barely making the semifinals by .03 seconds in 16th place, Adrian won the first semifinal heat in 47.83 to beat out Australia’s Kyle Chalmers in 47.93. The 100 free finals is at 6 p.m. Wednesday locally.